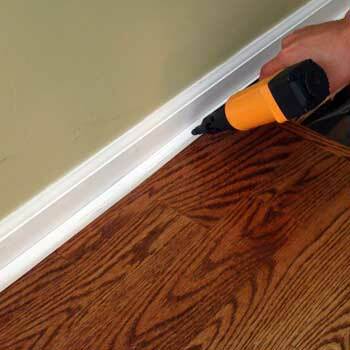 Home » Preparation » Baseboard Match Quarter Round? Here's another question often asked over the years. The answer lies in the timing of the building or remodeling process. Sound confusing? Bear with me. 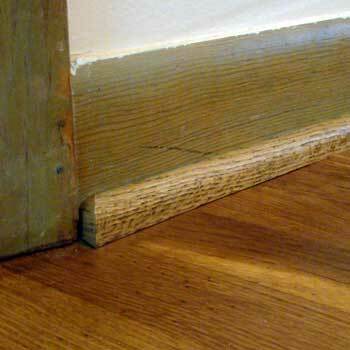 Why Use Quarter Round Against Baseboard Anyway? Most home builders will have the base installed and finished before any prefinished floors are installed. On the other hand, unfinished floors generally have the base installed afterwards. Why? Builders like to schedule most of the work together so they don't have to track down the sub contractors at a later date to come in and handle small duties. For prefinished floors the baseboard is installed, caulked and painted; basically finished. 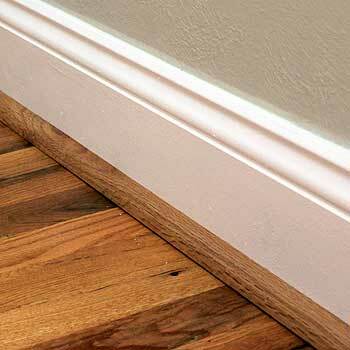 It doesn't leave you much of a choice, but many prefer the appearance of baseboard only next to their hardwood floor. Unfortunately in this case removal and re installation of the base can create problems. Not only can some pieces get damaged beyond being reusable but the caulk joints between the base and drywall have to be redone. The builder has to call in the paint and trim guy to do the same job twice. If your preference is no quarter round, let the builder know far in advance. Now the base will be installed after the floor. Everything is peaches and cream. Right? Not necessarily. The subfloor may have had a few waves in it which is now visible with gaps between the base and the finished floor. This is not necessarily a hardwood installers problem. Installers should be held responsible for establishing a flat subfloor before the work begins, but the range should only be 3/16 of one inch over ten feet. A few areas that gap an eighth of an inch could be scribed to fit. This will be a trim carpenters responsibility. If you're not prepared for this, you may be facing a dilemma you were trying to avoid all along. Now the builder may be saying..."do you want quarter round to match the floor or the baseboard?" Plan ahead, let the builder know you want base only, even if it requires additional work. So What Do I Do. Match The Floor or Baseboard? This decision is more or a personal preference, but leads to other related issues. The numerous emails I've had over the years indicates varying methods. 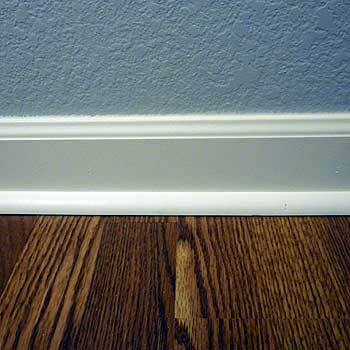 Colder northern climates often see dark base trim where many match the color of the floor. Moving to southern climates, lighter colored base is often the norm, with trim painted the same color. Quarter Round Or Shoe Molding? You will find many flooring dealers will try to steer you into matching moldings, specifically quarter round because it puts more money into their pockets. In my humble opinion, standard sized matching quarter round looks too bulky against any baseboard, especially common colonial or clam shell type base that only sits 3 ½ inches off the floor. Often the trim towers against the base trim. Shoe molding on the other hand provides a narrower visual, in that the dimensions are for the most part 7/16” by 5/8 inches in height. It may not sound like much but look at an example of both and you’ll agree shoe looks sleeker and doesn’t shout out at you. Chances are good you will not get far with any builder, installer or store owner on this one. 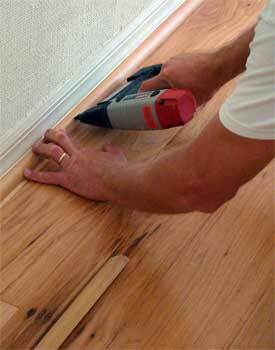 Not only is net fitting to the baseboard very time consuming but it will restrict the natural expansion and contraction properties hardwood floors need.